If you want to get right down to the historic nitty-gritty of NYC, this excursion will take you to the juicy and satisfying core of the Big Apple in one big, 3-day bite! You and your student group will explore the City that Never Sleeps from top to bottom – literally. Midtown Manhattan is arguably the busiest, most exclusive and most crowded piece of real estate in New York City; it’s also home to many important landmarks, and you and your student group will find loads of that “classic city skyline”-type architecture right here. Stops on this exhilarating morning excursion will include the Times Square Theater District, Bryant Park, the New York Public Library, Grand Central Terminal, The Chrysler Building, Rockefeller Center, Radio City Music Hall, Saks Fifth Avenue, the Waldorf-Astoria Hotel, St. Patrick’s Cathedral and King Kong’s favorite – the Empire State Building! Bring your camera, wear comfortable shoes and prepare to be impressed on this fascinating and educational two-hour trek. For a bird’s eye view of the City that Never Sleeps, grab your group and beat feet to Rockefeller Center - NYC’s most famous landmark – home to so many businesses it has its own zip code! Step aboard a supersonic elevator and soar straight to the twinkling, LED-lit “Top of the Rock” where you’ll enjoy exhilarating 360-degree views of Central Park and the breathtaking splendor of the dazzling city skyline from three observation decks. Purchase a special Sun & Stars ticket and score heavenly views twice in one day – the view after dark is nothing short of spectacular! Perhaps you’d rather see what King Kong and his lovely captive saw from atop the Empire State Building; if that’s the case, zip to a comfortable 86th floor stop featuring indoor and outdoor viewing options or climb 200 feet higher to the climate-controlled 102nd floor observation deck – the highest public point in New York City. 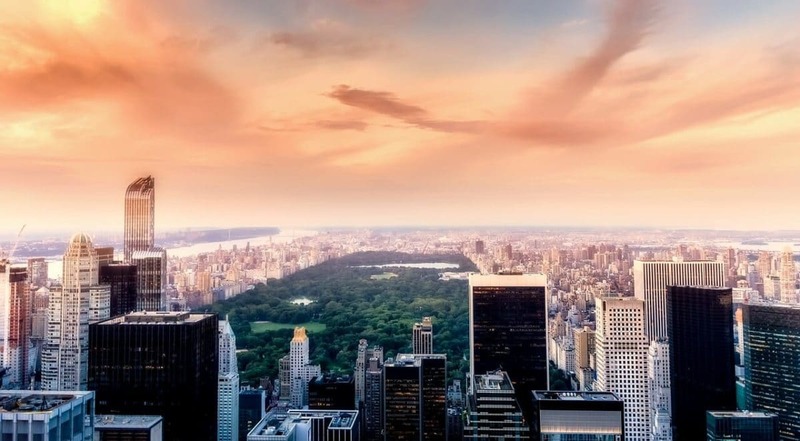 Both vantage points will offer incredible panoramic views from 1,250 feet above the heart of Manhattan; on a clear day, you can see all the way into Pennsylvania, Connecticut, Massachusetts and New Jersey. While it’s certainly wonderful to discover the myriad cosmopolitan wonders of “The Crossroads of the World” during daylight hours, there’s truly nothing like experiencing the razzle-dazzle of NYC’s Times Square after dark! Its huge digital billboards, bright neon lights, and sparkling, show-stopping storefronts are all part of the amazing explosion of sights, sounds, and attractions awaiting student groups opting to explore this world-famous intersection in the heart of the Theater District after sundown. Times Square, depicted time and again in popular cinema, is the home of the New Years Eve Ball Drop we all know and love, the Paramount Building, the Good Morning America show and so much more, it’s even earned another nickname: “Center of the Universe”! Decide what to see, head to the theatre, settle in and enjoy the show – it’s that easy, and there’s really nothing quite like catching a live performance on one of the world’s greatest stages! No student trip to the Big Apple would be complete without a “Great White Way” experience; with dozens of Broadway venues to choose from, there’s truly something for everyone – and absolutely no excuse to miss out on this time-honored entertainment tradition. Don’t forget to wait by the stage door for autographs; enjoy your evening! The 151-foot tall Statue of Liberty was a generous gift to our Nation from the good people of France, and is one of the most recognized statues in the world! She stands, vigilant, tall and proud on Liberty Island in New York Harbor, a breathtaking monument to freedom and democracy around the globe. Statue Cruises provide excellent traditional tours, ferrying you and your grad group out to meet our beautiful Lady, then on to landmark Ellis Island’s Immigration Museum for a little family tree research. Did your ancestors enter America through this National Gateway, once a hanging site for pirates? Every NYC student travel itinerary should include a visit to this important commemorative landmark. The National September 11 Memorial Museum serves as our country's principal institution concerned with exploring the implications of the horrific events of 9/11 and the 1993 World Trade Center bombing with a series of moving and relevant exhibitions. Portraits of more than 3,000 9/11 victims are displayed on The Wall of Faces, and a portion of the “Survivors’ Stairs”- the stairwell by which hundreds escaped with their lives after the 9/11 terrorist attacks - as well as sections of the Twin Towers’ structural columns remain, sobering reminders of this horrific act. You cannot help but come away from this experience with your heart forever changed. You’ve explored Midtown; why not spend a little time checking out Lower Manhattan? This fourth largest business district in the nation and the place American history started deserves a spot on every student group’s Big Apple agenda! It’s where the first U.S. Congress assembled and hammered out the Bill of Rights and where our first President, George Washington, was sworn into office. It’s the home of Wall Street and the New York Stock Exchange, and it is here the unspeakable 9/11 tragedy occurred, and an important rebirth is underway. Walking tours depart from the Charging Bull Statue, cover approximately one mile’s distance and generally take around two hours to complete. You’ll see Wall Street, Trinity Church, Ground Zero, Chinatown, Little Italy and a host of other popular Lower Manhattan attractions. Come on, sleepyheads – rise and shine! Grab an early breakfast and head on over to the Today Show Plaza to watch a live taping at Rockefeller Center. See how it all comes together, with great tips from the pros on how to create a great high-visibility poster. A spot at the front of the barricade ensures the best chance to be seen on TV; be sure to tell your friends and family back home to watch for you! For a fair shot at meeting the hosts, get over to the 49th Street side of the Plaza; so EXCITING…and so New York! You and your students will enjoy a stroll through the Big Apple’s gloriously landscaped 843-acre backyard. An oasis in the heart of the bustling city, Central Park tenders visitors a fabulous escape from the frenzied crush of crowds and dizzying pace of life in the concrete jungle. Our country’s first real park features acres of natural woods, two ice skating rinks, 21 playgrounds, one of the largest merry-go-rounds in the country, its own zoo and a glorious heirloom rose garden. This beloved refuge is peppered with uniquely intricate bridges and wound about with scenic footpaths; birding and wildlife watching opportunities abound, and boat/kayak rentals can be secured at Loeb Boathouse. Carriage rides through Central Park are an enchanting tradition, and plenty of open-air performance venues treat audiences to countless concerts and productions – the Shakespeare Festival is not to be missed! The American Museum of Natural History is truly a behemoth; prepare your student group for lots of walking and a return trip or two; it’s THAT big! Visit a lush butterfly rainforest, drift into the Dark Universe in Hayden Planetarium and thrill to a Great White Shark experience, IMAX-style. A hike through the Hall of North American Forests introduces visitors to the ecology and variety of the forests of North America—from a northern spruce and fir forest of Ontario to a giant cactus forest in Arizona. Wander the Biodiversity and Environmental Halls and marvel at their vivid and inspiring vision of the spectacular beauty and abundance of life on planet Earth. The Bernard Family Hall of North American Mammals offers a stunning snapshot of North America’s rich environmental heritage, while the Hall of Small Mammals depicts a variety of animals in detailed dioramas of their natural habitats. Every year, the Museum’s beloved origami holiday tree delights guests from all walks. Hear the story of Lonesome George, excavate the endless wonders of Fossil Halls, shimmy beneath a 21,000-pound model of a Blue Whale in the Milstein Hall of Ocean Life, and so much more! “The Met” is the largest art museum in the United States, housing a stunning compilation of collections displayed in more than 400 galleries and hosting exhibitions and special events throughout the year. Your student group is welcome to explore this magnificent museum on their own, or opt for one of a variety of engaging, hour-long special highlights tours departing every fifteen minutes from The Great Hall throughout the day, between 10:15 a.m. and 4:00 p.m.